Plus: You'll also get a PowerPoint presentation you can use to train managers on how to write job descriptions. Margie Mader-Clark has worked at the highest levels of the HR profession for more than 15 years, primarily in the fast-paced world of Silicon Valley. She has experienced the power of good management -- and the devastating impact of poor management. Mader-Clark has worked with numerous companies to develop commonsense HR principles to guide their employment policies. If you are like many managers, you probably don’t enjoy spending time on job descriptions. You might not know how or where to begin the writing process, or you may simply have too many pressing issues on your plate to justify taking time out to create what seems like an unimportant personnel document. But a job description isn’t just a piece of paper that sits in an employee’s file. It’s a living document that will help you market the job, and hire, manage, encourage, review, and, if necessary, discipline or terminate employees. By clearly stating what you expect of your employees, it provides a solid foundation for all of your management actions. 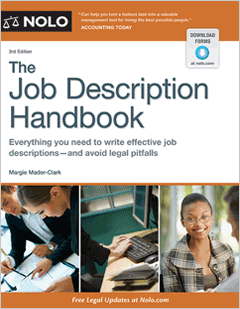 This chapter provides an overview of the process of creating and using job descriptions. It explains the many advantages of using job descriptions, introduces the ways you can (and should) use them in every stage of the employment relationship, and talks about your role—and the role of others—in the process of creating a job description. In some companies, job descriptions are dry, outdated documents whose main purpose seems to be taking up space in a filing cabinet or on a server. But these companies are missing a tremendous opportunity to improve productivity and morale—and running a high risk of legal trouble in the future. A well-thought-out job description provides you and the employees who report to you with a blueprint for success. It’s the basic tool you use to hire, measure, and manage the performance of each of your employees and of your team as a whole. • The job description is the basis of your search for a new hire. By clearly defining the job up front in writing, and using that document to make sure candidates know what the job entails, you will have already established and communicated the requirements for success. The job description will also weed out those who don’t have the qualifications necessary to do the job, which will save you time in the long run. • The job description can be modified and used to market your job online. You can adapt portions of the job description to create customized email messages targeted at candidates who use online networking sites such as LinkedIn or Facebook. This will give you a much broader pool of applicants to choose from when filling your position. • You can use the job description as an interview tool to help you find the best person for the position. Once you have the job outlined, you can build your set of interview questions around the job’s actual requirements—which will not only help you find a great hire, but also help you steer clear of topics that could lead to legal trouble, such as an applicant’s disabilities or private life. And when it’s time to choose from your pool of applicants, you will already know exactly what qualities and skills the successful candidate should have. • New (or recently promoted) employees can use the job description to get an immediate understanding of what you and the company expect. By explaining what the job requires up front, before an applicant accepts the offer, you can eliminate much of the fear, uncertainty, and doubt that often accompany the decision to accept a new job. You can also help employees hit the ground running on their very first day of work. • The job description is the basis for solid performance management. Once your employee is on board, you can use the very same job description you used in the hiring process to explain what constitutes success in the job. You can measure how an employee is doing against those expectations and help an employee get back on track, if necessary, simply by referring back to the job description. Keeping the description up to date as the position changes will help you coach your employees and give you standards by which to measure performance fairly and accurately as positions and responsibilities change. • Job descriptions can be used to determine pay levels. By accurately describing what a job entails, and the skills, credentials, and other qualifications necessary to get it done, a job description gives your human resources department a solid way to measure the value of a job and set the pay accordingly. If your company doesn’t have a human resources function or a formal compensation program, the description will give you a way to compare this job to other positions in the company when you or others set pay rates (or lobby higher management to budget more money to your department’s salaries). • an important part of your company’s legal defense if a former employee files a discrimination or wrongful termination claim. When you write a job description, you are defining and documenting a position. This process gives you, the manager, an opportunity to clearly describe what you are looking for, including the skills and abilities that will make your team stronger in the future. Being clear and reasonable when you first describe the job will save you a lot of time and trouble in the long run. You will set the expectations for the hire, for the person’s performance throughout his or her tenure in the job, and for others who may be interested in that job in the long term. You also have a great opportunity at this point to think carefully about the current state of your team, their collective skill set, and what you believe may be necessary to succeed in the future. If you think your team is lacking in certain areas, you can try to bridge the gap by writing a job description that includes those critical skills and functions. If you don’t have much input into the directions your company might take in the future, you can use what you know about the company’s plans to position your team for success. This simple model (commonly known as a “gap analysis”) allows you to plan for the future even while you are making sure that the company’s present needs are met. Of course, the essential functions of some jobs won’t change, even if your company or department does. For example, an accounts payable clerk will most likely always be responsible for assuring that customers pay their invoices in a timely way. Even if your company decides to dump one product line and move into another, the clerk’s day-to-day responsibilities will be largely the same. However, if your company is planning to change from one accounting software program to another, then you might want to write a job description that requires expertise in the new program. If you are clever in your hiring, you may even be able to avoid paying for extensive training on the new program. By focusing on the future, you can help your department transition rapidly to the new program and save precious expense dollars along the way. Managers know all too well that opportunities to plan ahead and set their teams up for success don’t present themselves every day. That’s why you should take advantage of the job description process to do a little long-range planning whenever possible. Once the job is defined and documented, it’s time to think about how you will find the best candidate to fill the position. “Marketing” your job wisely—to places where you are most likely to find people with the right skills and experience—is a tried and true strategy to ensure a good hire. Writing the description gives you a clear understanding of what you’re looking for in filling the position, which in turn gives you a good idea of where to look for strong applicants. Whether you choose to market the position through online job postings, help-wanted ads, college job search websites, or professional and social networking sites, you can adapt what you’ve already written in the description to create your posting. • you pose similar questions to every applicant for the position, which will allow you to compare their skills and abilities directly (and protect your company from potential discrimination claims). However, this doesn’t mean you have to adhere rigidly to the qualifications described in the description when interviewing, or that you have to ask every applicant exactly the same questions. Instead, you should use the description as a starting point to come up with questions that encourage candidates to talk about their experiences. And when you’re actually conducting an interview, don’t miss opportunities to ask follow-up questions that delve more deeply into areas the applicant brings up. Example: Your job description for an Animal Trainer reads: “Must be able to apply the principles of Pavlov’s theories of behavior to the training of animals.” When interviewing applicants, you could simply ask, “Are you able to apply Pavlov’s theory of behavior to the training of animals?” The problem is that all but the most dim-witted interview subjects will answer in the affirmative, having figured out that you view this as an important job qualification. And while you’ve learned something about the candidate’s interview skills, you haven’t learned much about his or her animal training skills. If you instead ask “Have you used Pavlov’s theory of behavior in your past training experiences?” and follow up a positive response with questions about how the applicant did so, the answers will be much more informative. You’ll learn whether the applicant has actually used the training method, whether he or she understands how the method works, whether the applicant was able to apply it successfully, and what he or she thinks of the method. Instead of asking for a simple yes or no answer, you’ll have started a conversation that should yield plenty of information about the candidate’s qualifications and skills. For more information on using job descriptions to plan interviews, see “Conducting Interviews,” in Chapter 5. Once you’ve hired someone to fill the position, the job description will let the employee know what to expect. Think back on some of your first days at new jobs. They were most likely filled with doubt, uncertainty, and a little bit of fear. Will I be able to do this job? Will I get along with my coworkers? How long do we get to take for lunch? And where’s the bathroom? Hopefully, you didn’t have to wait too long to learn the answers to most of these questions. But imagine how much smoother the process would have been if you were immediately handed a detailed job description for your position, outlining the company’s expectations, your responsibilities, your reporting relationships, and more. By writing well-crafted job descriptions, you can tell your new hires exactly what you expect of them. Employees can sit down with you on their first day of work, prioritize their tasks, figure out what to focus on immediately, and hit the ground running. By helping your new employees become productive right away, you’ll also save some of the time you would have spent on coaching and training—which will allow you to stay focused on your own job responsibilities. For more information on using job descriptions for orientation, see “Orienting New Hires,” in Chapter 5. A clear job description sets the stage for good performance by letting employees know what you and the company expect of them. When it’s time to do performance evaluations, you can use the job functions spelled out in the job description to measure how employees are doing. Descriptions also help eliminate arguments about ratings and appraisals. Because a good job description tells employees exactly what they are expected to accomplish, employees won’t be able to argue later that you surprised them by using unexpected factors to measure their performance. And because every employee in the same position will be rated on the same performance factors, it will be more difficult for an employee to claim that you were unfairly harsh or imposed additional requirements on him or her—an argument that can form the basis for a discrimination lawsuit. Example: Here is a section of a job description for a staffing manager. The bullets represent the basic functions of the job. n Build Company X’s brand as a place to work. the candidate selection pool is populated with people of many and varied viewpoints. incurred in the creative use of external search providers. n Manage staffing vendor contact negotiations. n Create and implement College Recruiting Program. Turning this description into a measurement tool is as easy as adding a rating section. In this example, you can use a simple numerical scale, ranging from a “1” for very poor performance to a “5” for outstanding performance. Build Company X’s brand as a place to work. Create and implement selection strategies that lead to sustainable, high-performing teams. Build upon Company X’s diversity and inclusion programs to assure that the candidate selection pool is populated with people of many and varied viewpoints. Develop robust sourcing strategy that ensures strong candidate flow for Company X’s current and future vacancies and rationalizes costs incurred in the creative use of external search providers. Manage staffing vendor contract negotiations. Create and implement College Recruiting Program. Using this simple worksheet taken straight from the job description, you can rate your employee’s performance quickly, gather feedback on the employee from coworkers and others, and share the results with the employee. See “Measuring and Managing Performance,” in Chapter 5, for tips that will help you use job descriptions to evaluate performance. Need help with performance evaluations? The Performance Appraisal Handbook, by Amy DelPo (Nolo), provides a step-by-step system for tracking, evaluating, and communicating with employees about their performance. You can learn more about the book—and buy a copy—at www.nolo.com. For employees who are either exceeding your expectations or struggling to improve, you can use the job description as a benchmark for how things “should” be going. Let’s take poor performance first. If an employee is falling short in specific areas, you can refer to the job description when you meet with the employee to discuss the problem. Whether you are raising the issue in a casual conversation or following your company’s formal disciplinary procedures, using the job description will give you a point of reference for your conversation and remind you to limit your comments to the employee’s performance issues, not personal traits or characteristics. Many companies follow a progressive discipline policy, by which managers first bring problems to the employee’s attention through coaching, then a verbal warning, then one or more written warnings, then termination if the employee is unable or unwilling to improve. You can use the job description at every point in this type of process. The first time you meet with the employee to talk about a performance problem, refer to the job description to highlight areas of concern. You can also use the description to explain what’s going wrong and why it needs to improve. By starting your conversation by referring to the job description, you have short-circuited any effort by Karen to argue that she didn’t know the call requirement. You have also told her that some thought went into developing the quota number, which should help you avoid an argument over whether it’s really necessary for employees to handle that many calls. And, you’ve demonstrated that the problem is serious: She isn’t meeting a written job standard. All of this will set the stage for a more productive discussion of how she can get back on track. For more serious disciplinary measures, you can use the job description to come up with a written plan for improvement with the employee. And, if you have to fire an employee for poor performance, you can use the job description to show that the employee knew all along what you and the company expected, and that the employee ultimately failed to meet those requirements. This will make it very tough for the employee to later argue that he or she was wrongfully terminated. Need more information on employee coaching and discipline? Check out The Progressive Discipline Handbook, by Margie Mader-Clark and Lisa Guerin (Nolo). It provides all the sample forms, step-by-step instructions, and strategies you need to discipline employees effectively. Pick up a copy at www.nolo.com. Strong performance can also be measured by the original job description. If your employee is really hitting the ball out of the park, schedule a meeting to let him or her know how thrilled you are! You can use the job description to show exactly how great a job the employee is doing. This is also an ideal opportunity to discuss the possibility of assigning new responsibilities to the employee. There may be some logical additions to the employee’s current workload, or you may brainstorm together to come up with ways to keep things interesting and challenging. Remember, if you decide together to alter the job, you should update the job description to make sure it accurately reflects what you both believe the job to be. For more information on using job descriptions to manage employees, see “Measuring and Managing Performance,” in Chapter 5. As you work to keep up with the changing demands of the company, you should update the job descriptions of positions that report to you to reflect new developments and needs. Example: John manages an auto body shop specializing in Toyonda sport-utility vehicles. All of his mechanics are certified by Toyonda, have a minimum of seven years of experience in repairing these vehicles, and are equally familiar with every SUV Toyonda makes. John receives a letter from Toyonda America announcing the arrival of the Toyonda Hybrid SUV—a modern ecological marvel that uses both gas and electricity. John is quick to realize that his mechanics’ jobs are about to change. He needs to make sure that his shop can handle repairs to these new vehicles. John pulls out his trusty Mechanic I Job Description. He adds a bullet to the job functions section, stating that mechanics must be certified in hybrid SUV repair. With this new description in hand, he meets with his mechanics to talk about how they can meet the new requirement—for example, John might offer to pay for a training session. Or, John could hire a new mechanic who is already familiar with the hybrid, and let him or her handle all repairs on the new vehicles. John has responded to the changing conditions of his workforce in a simple, effective way—and it all started with updating a job description. As the needs of your business change, you need to respond by keeping your workforce up to date on the changing requirements. Changing the job description is an easy way to track and communicate these developments—and to make sure you have the resources necessary to succeed in the new regime. For information on updating job descriptions, see Chapter 6. Of course, the primary responsibility for writing the job description falls on you. You will manage the position for which you are writing the description, so you have some unique insights into what the job requires. This doesn’t mean that you should write the job description in a vacuum, however. In fact, getting others in the company—from your boss to other managers to any employees who will report to the person in that position—involved in the process will make your job description more accurate and complete. 1. Write the first draft. Even if you don’t know every single thing about the position, you can certainly take the first stab at describing it. The information and exercises in Chapter 3 will help you gather and analyze the information you need. And the tips and examples in Chapter 4 will help you turn your ideas into a compelling and accurate description. 2. Gather input from others. Once you have completed a draft, you should circulate it to others and ask them for their comments. This input will make the job description as accurate and relevant as possible and help you make sure that you didn’t leave out anything important. 3. Incorporate the input from others. Once you gather feedback from others, you should revise the job description to include all relevant input. You’ll have to be selective, however: If your boss gives you a long “wish list” of qualities the ideal candidate should have, for example, you may have to pare it down to the essentials. 4. Update as necessary. Once the description is complete, don’t just throw it in a drawer and forget about it. A job description is a living document that may need to be revised as the job requirements change. In fact, you may meet an ideal candidate who can actually do more or different things than you originally outlined, which means you may have to update the job description before you even make a hire! As your team and your company change, make sure your job descriptions remain up to date. And remember to share any changes you make with the person actually doing the job, to keep everybody on the same page. With all these people relying on this position in some way, doesn’t it make sense to gather their input on what the job requires? Each will bring a unique perspective that you may not be able to come up with on your own. The end result will be a well-rounded position that answers the needs of all those who will eventually work with the person who holds it. Keep it simple. The more people who provide feedback on the job’s ­requirements, the harder you will have to work to keep the job description reasonable. Although many people may have valuable input and ideas, it is ultimately your job to draft a description that is straightforward and achievable. If you discover that too many people have too many expectations of the person who will fill the job, it might be time to consider other ways to get this work done, like hiring more than one person or shuffling the job duties of your existing reports. Now that you know the advantages of using job descriptions, how they are used in the life cycle of a job, and your role in writing the job description, you are probably eager to put pencil to paper (or fingers to keyboard) and start writing. But before you do, you’ll need to know the potential legal pitfalls associated with writing job descriptions—and how to avoid them. These are covered in Chapter 2. 1. You can create an effective job description by adapting one of the many templates available on the Internet—you don’t have to write it yourself. 2. It is easy to hire a well-qualified person even without a job description. 3. You can use the job description to craft good interview questions. 4. A well-written job description can give the person already doing the job a good road map for success. 5. Proper use of a job description in the interview process is a foolproof way to keep out of court. 7. It is important to note on a job description whether you prefer a man or a woman for the position. 8. As long as an employee is performing well, you won’t need to refer to the job description to manage him or her. 9. If you use the job description to measure employee performance, you are in danger of confusing your employee. 10. As the person who will manage the position, you are the sole source of information in creating the job description. 1. False. A job description won’t be effective unless it accurately describes the position and its requirements. No form you download from the Web can do this for you. 2. False. It is more difficult to make a quality hire without understanding everything the position requires—and whether your applicant can meet those requirements. 3. True. Because the job description includes the essential functions of the position, you can use it as a basis for an interview that effectively explores whether applicants can do the job. 4. True. You can always measure a person’s success against your original expectations, as laid out in the job description. 5. False. While job descriptions are very helpful, there is no “foolproof” way to stay out of court. 6. False. You will find the job description an excellent tool throughout the life cycle of a job, from hiring to managing to refilling or restructuring a position. 7. False. Your job description should focus solely on the job and its real requirements. Including preferences like these can lead to discrimination lawsuits and prevent you from reaching the broadest possible applicant pool. 8. False. The job description can help you determine just how much your star employee is exceeding the original requirements of the job. It can also help you decide whether to add or change the duties of the job to keep it challenging and fulfilling. 9. False. The job description tells employees exactly what your company expects, and should be the basis for measuring their performance.